Madeleine L’Engle’s novel “A Wrinkle in Time” can feel like a constellation of concepts too abstract to be understood. Written during the tense U.S.-Soviet space race, the novel whisks away its characters into the cosmos, and its slim binding opens up to a fifth dimension, three sages who were once literal stars, and a crawling mass of evil itself. L’Engle anchors such immense imaginings in earthly detail. The novel’s self-mocking humor and the specific struggles of its characters temper the unimaginable with the tangible. Ava DuVernay’s 2018 sparkly film adaptation tips the story further toward the realm of the grandiose, sometimes at the cost of the personal narratives that originally kept it grounded. The year before the novel’s publication in 1962, a Soviet, followed by an American, had become the first human in space. NASA was just four years old. Neil Armstrong would not set foot on the moon until seven years later. While literature has imagined space travel since the second century, 1962 was a particularly exciting time to write about entering space. L’Engle’s imagination filled the gaps in scientific knowledge with concepts as large as the fifth dimension (which allows characters to wrinkle space and time) and love. In retrospect, the space scene of both the book and the film, in which a girl’s love for her brother defeats Evil itself on a faraway planet, seems to fight the tensions of nuclear warfare and the space race. L’Engle imagines a space journey that threatens to end in the world’s devastation but instead ends in peace. Whether or not L’Engle intended to comment on destructive political tensions, her novel promotes communication and understanding between dissimilar people. 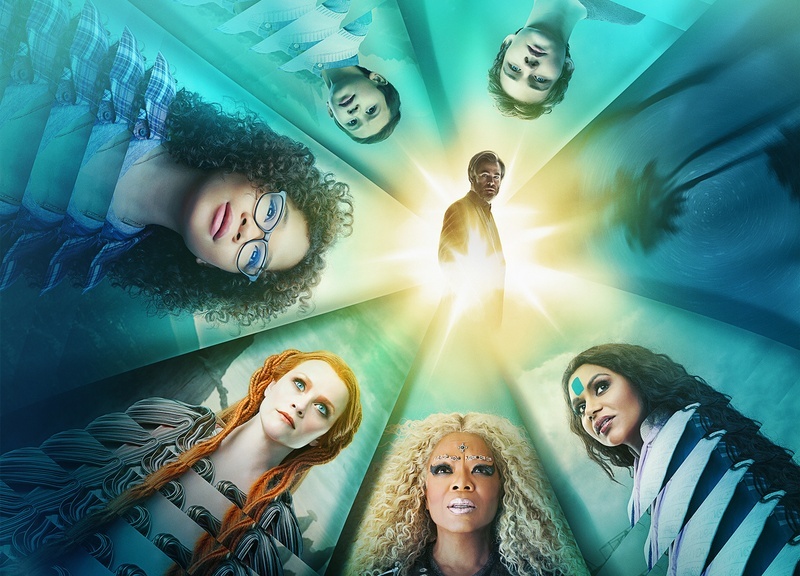 On a terrestrial scale, protagonist Meg Murry (Storm Reid) and her little brother Charles Wallace (Deric McCabe) are ostracized at school, leading to Meg’s increasingly aggressive behavior. The dystopian planet called Camazotz to which everyone moves amplifies L’Engle’s critique of exclusionary thinking, as does the brainwashing of Charles Wallace. In the novel, he responds to his sister’s recitation of the Declaration of Independence by saying, “That’s exactly what we have on Camazotz. Complete equality. Everybody exactly alike.” Meg retorts, “Like and equal are not the same thing at all!” The characters’ strengths, the story reveals, lie in their abilities to relate to people who are not like them. DuVernay’s film debuted during another escalation of nuclear tensions and another resurgence of nationalism. However, in the film, the critique of exclusionary thinking is overshadowed by a plea for self-acceptance, which was secondary in the novel. The film skips the diversity-promoting scene with the Declaration of Independence, for example, and foregrounds confidence using saccharine lines like “You just have to find the right frequency and have faith in who you are.” The banal sentiment is rehashed by the soundtrack’s whiny pop anthems. In a similar spirit, the film sanitizes the story of Meg’s friend Calvin’s (Levi Miller) emotionally estranged, physically abusive family, but adds the same aforementioned self-acceptance backstory for Meg’s schoolyard bully (Rowan Blanchard): She takes her insecurity about her weight out on Meg. This is not to say the theme of embracing multiplicity over uniformity is missing from the film. The casting of a multiracial Murry family, which was white in the book, aligns with the book’s encouragement of diversity. In fact, the casting of a black Meg can be seen as a update on L’Engle’s original decision to make her protagonist a girl, which was unusual in science fiction and possibly a reason why reason at least 26 publishers rejected her. The placement of people in unusual roles was at the heart of the book’s conception. Still, a certain eccentricity is lost from page to screen. The contrast is most apparent in the portrayals of Mrs. Whatsit (Reese Witherspoon), Mrs. Who (Mindy Kaling), and Mrs. Which (Oprah Winfrey), the stars-turned-almost-women who guide the children through their space journey to save their scientist father. Mrs. Which has a golden moment of humor in the novel when she begins to materialize on Earth but proclaims, “I ddo nott thinkk I willl matterrialize commpletely. I ffindd itt verry ttirinngg.” Not only does Winfrey as Mrs. Which materialize in the film, but she arrives magnified to a giant’s size, cut and pasted into the sky like an unwieldy photoshop project. Another delightful image lost in translation onto the screen is Mrs. Whatsit, engulfed in an outfit of scarves, falling over in the Murrys’ kitchen and leaking rain water out of her boots. While the film has spectacular technology at its fingertips, the book ultimately manages to capture the most stunning visuals. As if the celebrity presences of Winfrey, Witherspoon, and Kaling are not conspicuous enough, they wear jeweled eyebrows and gowns that could be their next Met Gala outfits. The film’s reluctance to show the Mrs. as anything less than breathtaking weakens the book’s earnest respect for oddball characters. The film generally avoids the grotesque images that help make the book compelling. Everyone and everything is impossibly pretty. And yet, despite the attempts at visual splendor, the on-screen renderings are somehow less stunning than L’Engle’s descriptions. The story, already cosmic in nature, did not need the film’s attempts to add resplendency. Still, the film would have benefitted from taking itself a little less seriously. An openness to more of the book’s awkwardness, humor, and pain would have helped to remind viewers why, for 56 years, readers have accompanied L’Engle’s misfit characters on their mind-boggling journey through space and time.